News reached my little home that the main road nearby was clear so I decided to make an epic treck out into the frozen north to see how far I could get. Defrosting the vehicle is epic enough when covered in six inches of snow (yeah, snow that even my high heels can't lift me out of) but due to utter boredom from being stuck in the house I attacked it with enthusiasm and even gave a Westwood scarf it's first outing. I knew I was too enthused when I found myself sculpting the snow on the roof of the car into "a cute white hairstyle". Then I started to get a bit cold. The snow was so thick on the sides of the car that when it came to doing the side nearest the fence I had to clear the snow in front of me in order to get to the rest of the car. During defrosting of wing mirrors my brave and worthy efforts were briefly interrupted by a typical blonde moment. I sprayed the de-icer in the wrong direction, and the shock of having my face de-iced caused me to fall backwards into the snow screaming, and consequently loose both the de-icer spray and the de-icing scraper thingumy object into the snow. ...I didn't discover that I'd lost them until I'd returned from de-de-icing myself inside the house. And getting into the house was difficult, covered in snow, freaking out, one eye shut against de-icer and charging at the door full force until to go splat against the window in discovery that I'd locked the door. *sigh* Anyway, the car was de-iced and I set out enjoying the weird way my dear little ford fiesta moved trying to fight it's way through the thick snow. We found our way to a "clean" road with cheers and wonderment and set off at a dangerous 25mph in over excited enthusiasm. The ice at the first crossing slowed us down considerably. Reached the supermarket fine and parked wrecklessly in what I assumed was the disabled area (though I couldn't see through the snow, and that was my excuse for finally rebelling against half the car park being taken up with spaces that no-one uses). There were two other cars in the car park, thoroughly frozen and obviously belonging to staff. There was no bread, (woohoo! justification of the bread maker I bought before xmas just in order to make the cinnamon roll recipe from Julie Anne's blog ), no fruit except for a teeny bunch of child size bananas, and no frozen chips that weren't in "microwavable boxes". In fact there was little or none of all the sensible items. Therefore I was totally excused for stocking up on double chocolate cheesecake, potato wedges, walkers crisps, Fry's Turkish Delight and the "expensive" italian food in the fridge department. Tried to commiserate with a bloke in the bread department who was having a rather audible nervous breakdown because there was no bread to make his kids' breakfast with... wasn't successful. I had cleverly substituted bakewell tarts for breakfast food and was feeling smug about it. Mother was stuck at her house with cupboards and freezers fit to bursting with food (she's a supermarket addict instead of a supermarket phobic like her daughter) but terribly distressed that her cats couldn't have wafer thin ham... so I was brave and bought a packet of dead animal for her cats. The road wasn't clear to hers in any way. Abandonned the car before it got stuck and trekked up the hill past teenagers who were still enjoying knocking each other over into the snow, a man trying to clear his driveway with the aid of a shovel and a wheelbarrow, and various women opening the door just to take a picture of the frozen wasteland so that they could prove it had happened. The flash bulbs were a bit of a shock in the snowy, lamplit darkness. You really don't expect paparazzi in Elland of an evening when everyone's snowed in. But I was prepared anyway in my Westwood "frozen weather ensemble" teamed with a coat which probably came from Matalan. 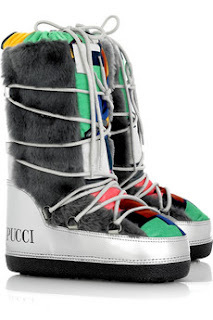 ...if this weather continues, I shall consider investing in Pucci snowboots. ...and one of those Anglomania coats that looks like a douvet and will match the pattern on "The Precious" (see earlier post). If you're going to fall flat on your face in the snow, at least look cute while doing it and then any boys nearby will come to pick you up and dust you off. If you're lucky they'll help you carry your shopping home too. I learnt this while living in Liverpool where there was an excess of helpful young gentlemen tripping over themselves to aid a damsel in any form of distress so long as she looked stylish or was wearing a short skirt. Anyway, got to mums with the provisions (handing over the last bunch of bananas in Elland cos she's addicted to the things) and managed to get my car going on a road where only wreckless fools would be stupid enough to change up into second gear. After a lot of revving and skating about I even got my car back up the drive withut bashing into either the fence, the house or the dustbin. Hurrah! Now I must be going as I have double chocolate cheesecake and micro chips to eat. Oh you poor thing!!! Sounds like you're coping admirably and very practically (scrumptious tarts for breakfast...mmmm, truly a Harlot's Breakfast). I thought it was bad enough sliding around the streets like Bambi in London and down in Hove, but this is nothing compared to what you Yorkshire folk are going through. Is post getting through? Shall I send supplies?? ?